You are currently browsing articles tagged PCUS. February 16: No Escape Clause! 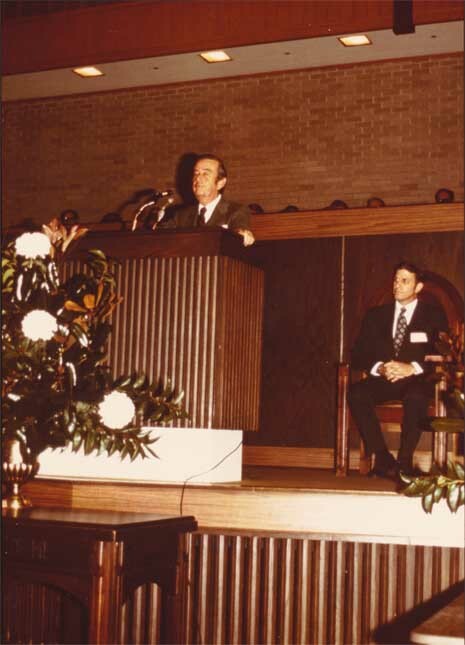 February 16 – 17, 1973 — A momentous date in the history of what was to become the Presbyterian Church in America. “Conservatives in the Presbyterian Church U.S. (popularly known as the Southern Presbyterian Church) have responded officially to the power plays and liberalism of the hierarchy of their denomination, and laid plans for the forming of a new denomination. A steering committee for a continuing church met in mid-February in Atlanta to lay specific plans for the new church, and did not immediately release those details. But the scope of the new move was apparent because of the broad base of participation at the Atlanta meeting. Included were leaders of Concerned Presbyterians and of Presbyterian Churchmen United, two protest groups within the Southern denomination, as well as the leaders of the Presbyterian Evangelistic Fellowship and the Presbyterian Journal. Many of those represented had looked forward to the possible union of their denomination with the United Presbyterian Church (U.S.A.), because that union–even though it was with a liberal denomination–included an escape clause through which local churches could leave and keep their properties. But in early February, that union plan was scrapped by the liberal leaders of the Southern church. Conservatives believe the plan was abandoned because of a fear that too many congregations would exercise their rights through the escape clause. With no prospects left of being able to leave the denomination with their properties, conservatives gathered and voted unanimously to leave the church and begin anew. They will do so with no guarantees at all with respect to the numerous church properties involved. One of the most significant signs of promise for the BCO in the 1870s was that it lost its original association in PCUS opinion with centralization.. Few commented on the localist tendency of the recent revisions. However, except for an occasional muted expression by the Christian Observer, 177 fear of centralization ceased to be a major concern in the constitutional debate. Even leaders of the independent Missouri synod, by the time they joined the PCUS in 1874, felt assured that the Church and its constitutional projects were in accord with their view that “the Presbytery under the Constitution is supreme. Significantly, none of the seven controversial issues considered separately in 1877-78 was a centralization issue. Instead, the most articulate opponents of the BCO in the late 1870s were a few leaders, such as Plumer, who rejected the jure divino polity theories while they were gaining currency in the Church as a whole.179 By 1877 Plumer, increasingly isolated on the question, was inveighing against the BCO on the grounds that it was a disruptive change of the established system, without addressing the merits of its provisions. His opposition to constitutional change was entangled with his personal conflict with most of his Columbia colleagues, who had been Thornwell’s close associates.181 That kind of opposition, removed from the anti-centralist onslaught of 1867, would not indefinitely forestall adoption of the new constitution. The canvass of presbyteries in 1877-78 showed that the end of the constitutionmaking process was finally at hand. Now, American Presbyterians twenty-nine of the sixty-two responding presbyteries were ready to enact the BCO. In their votes on the seven separately-submitted issues, the presbyteries showed revisers the combination of provisions which would command maximum support. 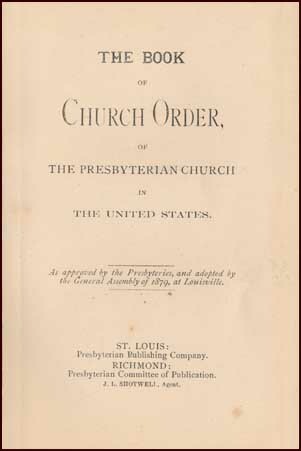 The 1878 Assembly used the presbytery recommendations to prepare a new text, and submitted it for action.182 Welcoming the prospect of consensus, the presbyteries ratified the draft constitution by 56 votes to 8. Appropriately, church leaders then fell into a last-minute dispute about the powers of the Assembly and the presbyteries. Some argued that the Assembly still had discretion to decide on the merits of the BCO, but others considered the presbytery actions determinative in themselves. On May 19,1879, acting on the latter interpretation, the General Assembly declared the Book of Church Order in force. Yep. Lewis Sperry Chafer, the founder of Dallas Theological Seminary, was a Presbyterian. As was Chafer’s mentor, C. I. 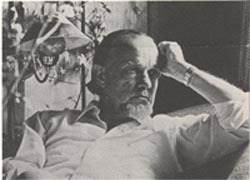 (Cyrus Ingerson) Scofield, and as was Scofield’s mentor, James H. Brookes. Presbyterians all. Perhaps that helps to explain how it was the dispensationalism made such inroads into Presbyterian circles in the era from the 1880’s to the 1930’s. That, and the fact that dispensationalists did a fair job of defending the Scriptures when few others. apart from the Princeton conservatives, would or could. Lewis Sperry Chafer was born in Ashtabula county, Ohio, on February 27, 1871. His parents were the Rev. Thomas Franklin Chafer, a Congregationalist pastor, and Lois Lomira Sperry Chafer, the daughter of a Welsh Wesleyan lay preacher. When Lewis was just eleven, his father died of tuberculosis. Lewis developed an interest in music while attending the New Lyme Institute as he prepared for college. At Oberlin College, he majored in music and met his future wife, Ella Loraine Case. After their marriage in 1896, he began to serve as an evangelist. An invitation to teach at the Northfield Boys School in turn led to a close friendship with C. I. Scofield, and as they say, the rest is history. Dallas Theological Seminary, founded in 1924 as the Evangelical Theological College, continues to this day. 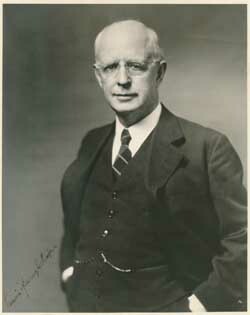 Its founder, Lewis Sperry Chafer, died on August 22, 1952. In a prior post we talked about Milo Jamison’s role in the split that created the Bible Presbyterian Church. Jamison was a dispensationalist, while the recently formed denomination that was renamed the Orthodox Presbyterian Church was quickly aligning itself against that system. In the last several decades, dispensationalism as a system has been going through a number of changes, but historically it has been anchored to three key tenets: (1) A “normal, literal” interpretation of Scripture; (2) A strict distinction between Israel and the Church; and (3) a scheme of dispensations or ages which divide up Biblical history. The latter two points are particularly where we find ourselves in disagreement with dispensationalism. 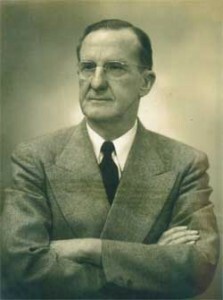 D. James Kennedy, when examining men for ordination, would routinely ask for the candidate’s views on dispensationalism, and whether the candidate approved or disapproved of the 1944 Southern Presbyterian report on dispensationalism. And Dr. Kennedy was right to use that Report in that way. However, the untold story behind that PCUS report is that in all likelihood, the Report was an attempt to split the conservatives in the Southern Presbyterian denomination, many of whom at that time were dispensationalists. As modernists were gaining power in the PCUS, the 1944 Report gave them an opportunity to set one camp of conservatives over against another and so dampen opposition to their own agenda. Few conservative Presbyterians today consider themselves dispensationalists. The old Reformation doctrine—really the old Biblical doctrine—of covenant theology is being taught once again, and taught well in our seminaries and in our churches. How it came to be virtually ignored in the 19th-century is something of a mystery, but the general lack of such teaching in that era does help to explain the rise of dispensationalism during the same time period. Nature abhors a vacuum. One of the better popular-level works on covenant theology is O. Palmer Robertson’s Christ of the Covenants. Ask your pastor about other helpful materials on this important subject. Image source: From a photograph on file at the PCA Historical Center, with the scan prepared by the staff of the Historical Center. The photograph lacks any indication as to who the photographer might have been. This day, January 15, in 1966 marks the death of the Rev. Flournoy Shepperson [10 October 1883-15 January 1966]. Flournoy Shepperson was licensed and ordained in July of 1917 by the Ouchita Presbytery of the Presbyterian Church, U.S. His first pastorate was in a yoked ministry to the Presbyterian churches of Magnolia and Mt. Holly, Arkansas, serving there 1908 to 1911. Rev. 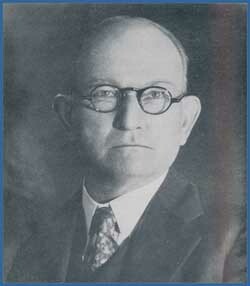 Shepperson next pastored the Presbyterian church in Monticello, Arkansas from 1911 to 1920, before answering a call to serve Purity Presbyterian church in Chester, South Carolina, from 1921-1925. His last pastorate in the PCUS was with the Second Presbyterian Church of Greenville, SC, which he served from 1925 to 1940. He then withdrew from the Southern Presbyterian denomination and united with the Bible Presbyterian Synod, while his brother David remained within the PCUS. Upon leaving the PCUS, Dr. Shepperson planted a Bible Presbyterian church in Greenville with an initial congregation of 335 members. The church later took the name Augusta Street Presbyterian church, and eventually became part of the PCA, though it was dissolved in 1996. The Augusta Street church was also notable as the original location of theGreenville Presbyterian Theological Seminary. 1. The Presbyterian Journal,which began in May of 1942. Founded by a group of conservative Presbyterians, including L. Nelson Bell, the Journal was founded to work against the liberalism infecting the Presbyterian Church, U.S. (aka, Southern Presbyterian Church). 2. The Presbyterian Evangelistic Fellowship, founded by the Rev. William Hill, Jr., conducted revivals in PCUS churches. 4. Presbyterian Churchmen United (PCU), an organization of conservative pastors in the PCUS. Originally published on October 4, 1969 by the Presbyterian Churchmen United (PCU), the Declaration of Commitment was a clarion call issued to the ministers and people of the Presbyterian Church in the U.S. (PCUS)—a call for recommitment to the Word of God and to the Reformed Faith, signed by over 500 ministers and published in over 30 major newspapers. —That the faith of our Lord Jesus Christ turns men from darkness to light and from the power of Satan to God. By coming to faith in Him alone is there genuine reconciliation between man and God and man and man. —That the Holy Scriptures are the infallible Word of God, and that these Scriptures commit the Church to a mission whose primary end is the salvation and nurture of souls. —That Christian faith must bear fruit if it is to remain virile. These fruits vary from believer to believer. But common to them all are evidences of love, concern and neighborliness, toward all races of men without partiality and without prejudice, especially to the poor, the oppressed and the disadvantaged. The man of faith views all men as neighbors and himself as debtor, for Christ’s sake. —That, for the implementation of the above principles, in obedience to our ordination vows, we must strive to preserve a confessional Church, thoroughly Reformed and Presbyterian. Thus, our support of or opposition to any proposed union will be determined by these considerations. —That, being fully committed by our ordination vows to the system of doctrine set forth in the Westminster Confession of Faith and Catechisms, we must oppose all efforts to change in substance or otherwise debase our historic doctrinal commitment. —That, should the basic theology or polity of the Church be altered or diluted, we shall be prepared to take such actions as may be necessary to fulfill the obligation imposed by our ordination vows, to maintain our Presbyterian faith. In this clarion call, over 500 pastors called for the Church to remain true to the Reformed Faith, to remain a confessional and Presbyterian church, in doctrine and in polity. They staked out a position with this document, standing against a proposed ecumenical merger which would have taken their denomination into liberal and unbelieving waters. And they made it clear that they would not be party to such a merger but would honor their ordination vows. Image source: News clipping from the Paul G. Settle Manuscript Collection, Box 256, file 27, at the PCA Historical Center. Date [circa 1969] and source of the clipping not known.